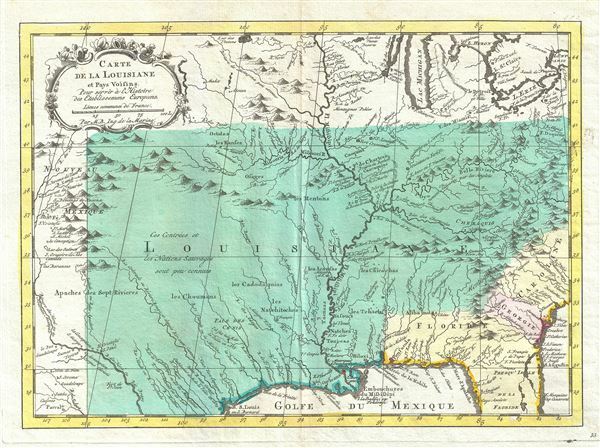 An important map illustrating the Mississippi Valley during the French and Indian War. Carte de la Louisiane et Pays Voisins Pour servir a l'Histoire des Etablissemens Europeens. This is an important 1760 map of the United States by the French cartographer Jacques-Nicholas Bellin. Centered on the Mississippi Valley, Bellin's map covers from the Riviere de Nord (Rio Grande) eastward to Lake Ontario and from Lake Huron to the Gulf of Mexico and Florida. This map is extremely rich in detail offering and naming countless American Indian settlements and villages. Bellin offers a wealth of new material throughout marking this map as a unique and meticulously researched production. Like the Delisle map it is based on, this map is significant on many levels, not the least of which is its presentation, from a French perspective, of the territorial alignments and claims of North America following the outbreak of the French and Indian War. The map's largest text block reads 'Louisiane' and fills the center of the map, clearly defining the map's focus. French territory extends as far east as the Appellation Mountains, relegating the British colonies to relatively meager Atlantic coastal holdings. On the opposite side of the continent French dominion extends as far as the Riviere du Nord (Rio Grande), including all of Texas and parts of modern day New Mexico - claims associated with La Salle's explorations and colonization of the Gulf Coast in 1685 (these claims, incidentally, led to 19th century U.S. Claims on Texas associated with the Louisiana's Purchase). Detailed identification of numerous American Indian nations and settlements throughout the territory, mostly along known river courses, further illustrate France's paternal and comparatively peaceable approach to New World Indian relations, commerce, and colonization. Most consider the French and Indian War to be a microcosm of the global Seven Years War. It was nonetheless notably distinct both in that it began before that larger hostilities in Europe and that most of the major battles involved primarily parties only loosely aligned with the French or English - most specifically American Indians and lawless frontiersman, who had their own political agenda. The war began with French incursions into western Pennsylvania and other territories claimed simultaneously by French, English, and American Indian forces. Just prior to the war, the French, in the interest of broadening their hold on the lucrative fur trade, established a series of forts, all of which are here noted, along the length of the Mississippi and further east, including Fort Duquesne, Fort de la Presquisle, and Fort Le Beouf. These last three forts occupied particularly contested territory under the control of the powerful British allied Iroquois League. The most contested these was Fort Duquesne, which stood at the Forks of the Ohio (modern day Pittsburgh) in direct opposition to another fort then being constructed by the Ohio Company, a trading and land speculation firm established by prominent Virginia colonials, including George Washington. The Virginia colonial governor responded to Duquesne by sending then Lieutenant George Washington and a band of Virginia militiamen to harass the French. The resulting Jumonville Affair, in which Washington oversaw an attack on a French Canadian diplomatic force led by Joseph Coulon de Villiers de Jumonville to warn the Ohio Company fort builders away from French claimed territory. The slaying of Jumonville and several other French diplomats prompted a response from French forces at Fort Duquesne, leading to Washington's retreat and construction of Fort Necessity, really little more than a palisaded shack, marked here just south of Fort Duquesne. These events, all of which occurred in May of 1754, were said to have increased hostilities in Europe and led to the start of the Seven Year War in 1755. This map was issued by Jacques-Nicholas Bellin in 1760. Very good. Original platemark visible. Minor wear along original centerfold. Old color.